Here’s further evidence that Apple wants to develop “smart bands” for Apple Watch. 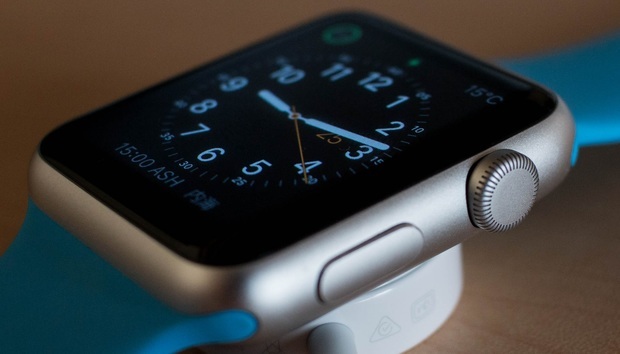 According to a recently published patent, Apple has developed a way for Apple Watch bands to incorporate a wearable battery that could charge the device on the go. These batteries could be partially embedded within a band or attach to an existing band, and they’d rely on the Apple Watch’s inductive charging technology to transfer power. Based on the images included in the patent application, a battery band can be made of flexible material to better accomodate a design that wraps around underneath the band. It also has a charging plate, similar to the Magnetic Charging Puck but way slimmer, that can rest on the belly of the watch to charge it on contact. The charging plate comes with magnets to help align the inductive coils, as well as perforations or translucent windows to allow for the Watch’s biometric sensors to continue working properly. In terms of charging the battery band itself, Apple’s patent gives two options. The battery band can be charged either via a Lightning cable or using the Watch’s Magnetic Puck, as the charging plate integrates the same inductive technology. This means that you might be able to charge both the Apple Watch and the battery band at the same time by resting them together on the puck. Furthermore, Apple has created a way to regulate that the battery band won’t overheat while wearing/charging the Watch. According to the patent, the charging plate will have sensors that can determine if the Watch is being worn. That way, it can determine whether to charge at full capacity or regulate how much power is being transferred to avoid heating up your wrist. Need any more indication? Just last month, another patent suggested Apple was interested in releasing a modular band with a full suite of “smart links.” Each link would have different capabilities, from monitoring your blood pressure to initiating a cellular connection. One of these links could also be a portable battery.